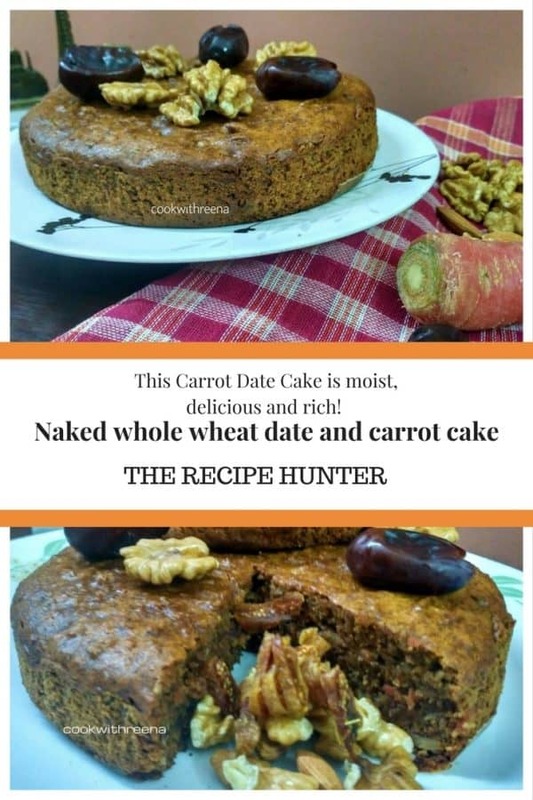 This Carrot Date Cake is moist, delicious and rich!! Preheat the oven to 160C for 15 mins. Line up the baking dish with butter paper. Deseed the dates and soak them in warm milk for 15 mins to make it softer. If you are using dry dates then it will require ½ hr to be soft. Dry roast the wheat flour on a hot griddle just for 2 mins. Sieve the flour, baking powder, baking soda and cinnamon powder. Add chopped walnuts, grated carrots. In a mixer or food processor, put the dates with little milk, enough for grinding it. If it thickens then add little more milk gradually. Now mix this wet mix into the wheat flour mix. Mix well so that everything combines well. If the mixture is too dry then add little more (1-2 tbs) milk. The texture will be similar to thick paste. Pour this mix into the cake tin. Tap the tin on the countertop so that air bubbles, if any, be released. Bake it in the oven at 160 degrees C for 1 hr. The healthy cake is ready to serve.